Homeowners Insurance In FL | All Discounts Applied! So, you need a new homeowners insurance in FL policy. That's no problem at all with RTC Insurance Advisors working with you. Providing insurance is what we do best. We are here for you. Not only are our policies from the greatest companies, we have so many of them to offer. Last time we checked, we are affiliated with 37 companies! For a quote, all we need from you is the bare minimum amount of information. This information is kept in confidence with us and our site is secure. Scroll down to see the questions that we need you to answer for us. If you would like to talk to one of our brokers, simply call 352-200-2066. We are always ready to assist. Not ready to ask for a quote yet? Maybe you still need some more information? That's certainly okay. Please take your time. 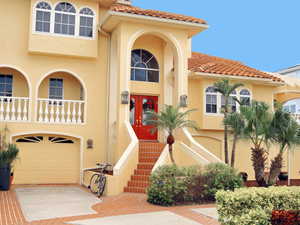 One this page, we have outlined some provisions a homeowners insurance in FL policy offers. Read the full article below and let us know if you have any questions. Did you know that we can figure out the limit of coverage for your home by using software and incorporating the values located on the county records? We sure can, so don't worry if you aren't certain about what limit of coverage to give us. A rough estimate is to take the heated square footage of your home and times that number by 100. Then add $25,000 extra for a garage and another $25,000 if you have a pool. Florida is a beautiful state, but there are a number of unique topographical and weather related situations homeowners must keep in mind when purchasing insurance. Most homeowners insurance in FL policies include coverage for fire, windstorms, or theft, but there are also several types of additional coverage available for special circumstances such as flooding or hurricane damage. One type of special coverage is ordinance or law coverage. Many companies automatically include this kind of coverage for a limited amount. If the cost of repairing or replacing a dwelling or structure increases because of a law or ordinance you will have to cover the costs out of pocket unless you have included this type of coverage in your policy. For more information you can call us or the Department of Financial Services (DFS) Consumer Helpline. Most homeowners insurance In FL policies automatically cover damage from a windstorm, but in high risk areas like Florida, many companies will exclude payment for these things. You should be aware of exactly what your insurance company is willing to cover, and what its exclusions are. For individuals who live in high risk areas, such as on the beach, there are alternatives available. Ask one of our independent insurance brokers today. For hurricane insurance, the deductibles can sometimes be prohibitive. However, the Hurricane Insurance Affordability and Availability Act makes a larger selection of deductible options available to homeowners. These deductibles are dependent on a number of variables, such as the value of the insured property, and only pertain to hurricane claims. As a result, you may have to pay out of pocket for damage incurred when a warning is declared or up to seventy-two hours after such a warning occurs. After the 2004 season new legislation was passed that limits the number of deductibles an insurance company may charge for hurricane damage. Now only one deductible per year per company can be issued. Once the deductible has been met, however, your insurance company may charge subsequent penalties under the heading “other perils”. This allows your insurance company to charge you additional deductibles while meeting the legal guidelines for the state. Make sure you read all your homeowners insurance In FL documents carefully to determine the extent of your coverage. There is more information available about high-risk coverage at the DFS Consumer Helpline. Call toll-free at1-877-693-5236 or visit the website at www.MyFloridaCFO.com, or visit www.citizensfla.com. Most important of all, be sure to read your insurance policy and any agreements you are considering before you sign. If you have any questions or are having difficulty understanding any portion of your insurance policy contact us, your Florida insurance broker, for clarification. Knowing what your options are, and the limits of your coverage, can save you time and money in the event you must file a claim.